By now it was approaching early afternoon and the wind had picked up. Obviously, a return by way of the Atlantic was out of the question. I asked my trusty navigator, Pam my wife, to plot a course for us to return via Taylor’s Creek on the Beaufort waterfront for our return trip back to Emerald Isle. Taylor’s Creek is a scenic trip and I highly recommend that trek. Just remember, all along the waterfront is a “no wake zone”, so take that into account when calculating your time. Beaufort is a pretty little town filled with neat shops, good restaurants and interesting homes. If you have time, check it out if you’re near Morehead City. As we were leaving the no wake zone, we traveled past Radio Island. Back in my college days, I spent a weekend there conducting research. I was taking a class in Marine Biology and our professor arranged for us to spend a weekend on the Island at the Duke Marine Labs. You have to understand, in 1972 there was nothing happening around Beaufort much less on Radio Island. Classrooms, labs, a boat and a dormitory was about all that was there. Come to think of it, I believe that’s all that’s there now. One more no wake zone in front of the State Port and then we were off at full throttle in the ICW to Emerald Isle. All of a sudden I heard my daughter scream “whooooaaaa Daddy”! The pregnant one couldn’t handle the steady pounding our little craft was dishing out. I pulled back the trottle and we “cruised” our way back to the marina. About this time, Brad, my son, pointed to my gas gauge. We looked at each other as if to ask, “are we going to make it back”? With the boat barely plained out, Brad and I began to worry. Our speed restricted to make the trek less painful, we wondered if we could make it back to our marina at Emerald Isle. Do You Sea Tow – I Don’t Sea Tow! Because my little boat seldom “drank salt water”, I never thought to purchase a Sea Tow rescue insurance package. It just didn’t seem like a smart investment, until now! Armed with my trusty cell phone, I figured we could give them a ring if we gave out of gas far from port. Now that would be a really big bill. Once we shared our news about our lack of fuel, the boat became really quiet. Hope renewed, in the distance I could see “the cut” where we would make our left turn to head to the marina about a 1000 yards away…almost home! All of a sudden, my little 4 cylinder began to “spit and sputter” chocking on its last sip of gas. As our boat sputtered one last time, a family out for a late afternoon cruise pulled out of the cut and I screamed, “can we get a tow”? Fortunately, they were accommodating and accepted my tossed rope. Our newfound friends pulled us to the marina and refused our offers of reimbursement for the extra gas used pulling us in. We will always remember all the fun we had on that day we took our trip to the Hook and back! 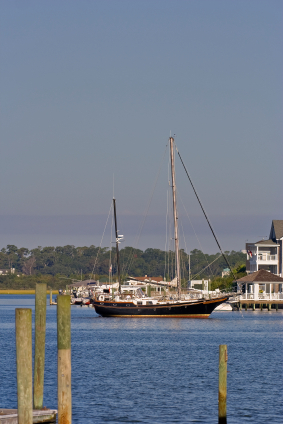 Have you made the trip to the Hook and back from Emerald Isle? What memories did you make? The Crystal Coast – Where Vacation Memories of a Lifetime are Made!